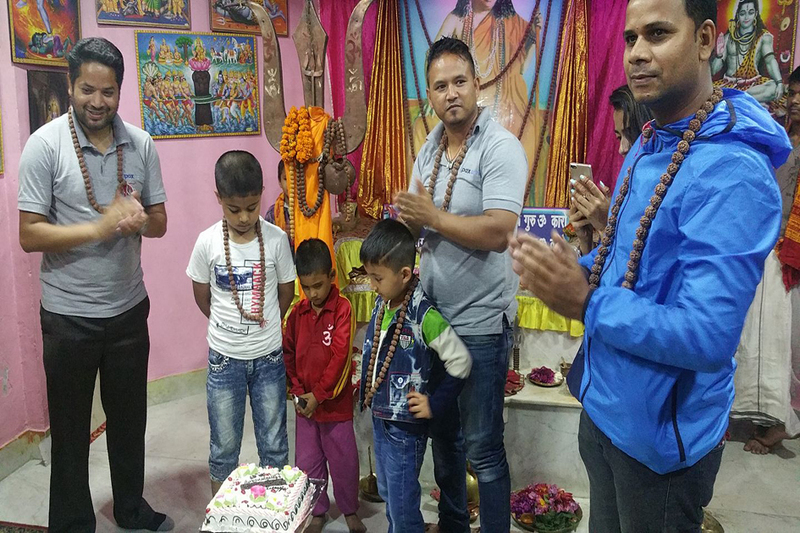 Pax Earth marked its 9th anniversary distributing green dustbins to ward 8 office of Kathmandu Metropolitan City (KMC), cutting and sharing anniversary cake and offering a meal to the underprivileged students at Pranavananda Ashram. A brief news on each activity is presented below. On July 16th morning, a Pax Earth team comprised of president Sujan Koirala, treasurer Bal Gopal Shrestha, board members: Jamuna Siwakoti, Bhagabati Pandey, Laxman Pd. Neupane, Manohar Sapkota, members: Kapil Deuja, Akira Shahukhal, Prabin Giri and Ayush Pantha went to KMC ward 8 office located at Jayabageshwori, Kathmandu. Ward chairman Dinesh Kumar Dangol and ward member Bibek Sangat warmly welcomed the Pax Earth team at the ward office. After a brief individual introduction, president Koirala provided a brief introduction of Pax Earth, stated objectives and key working sectors – education, environment and empowerment. He shared about the educational and environmental activities carried under Mission Education and Environment Project (MEEP) and ongoing Water to Livelihoods (W2L) project in Kavre. As Pax Earth situates in ward 8, Pashupati, it has a duty and responsibility to contribute to the community as well. Hence, Pax Earth has come up with a dustbin distribution plan as a token of support to keep Pashupati area clean. 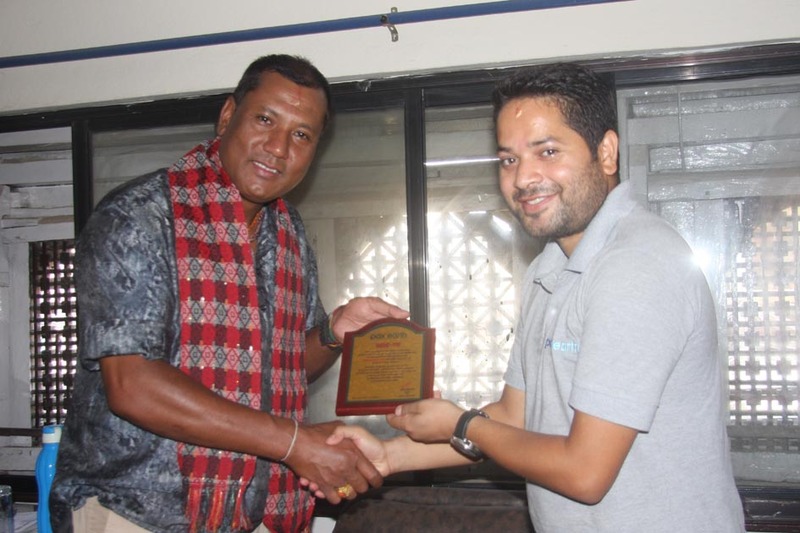 On behalf of Pax Earth, president Sujan Koirala honoured ward chairman Dinesh Kumar Dangol presenting a token of appreciation for being elected as the chairman of the ward 8 in recent local level election and extended best wishes to his team for a successful tenure. Board member Jamuna Siwakoti felicitated ward chairman Dangol and ward member Sangat putting a special khadda around the neck. 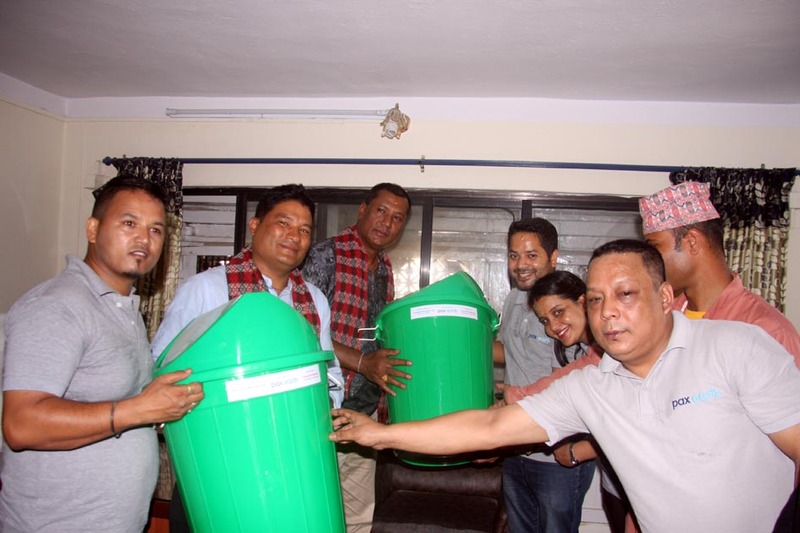 Then, the entire Pax Earth team handed 25 green swinging dustbins (50 litre capacity) to the ward chairman and ward member as a token of support to keep Pashupati area clean. Pashupatinath temple, the most sacred Hindu temple and one of the UNESCO’s World Heritage Sites of Nepal, situates in this ward. 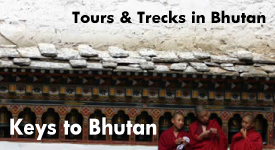 Pashupatinath temple is one of the most attractive tourist destinations in Kathmandu valley. President Koirala expected these dustbins to be placed and utilized properly in keeping Pashupati area clean. Ward chairman Dangol congratulated Pax Earth team for completing 9-years of founding and wished for more progress and prosperity in the days, months and years ahead. He highly praised the noble job of Pax Earth to provide 25 green dustbins to the ward office. He has assured that the dustbins will be utilised properly in keeping Pashupati area clean. Ward member Sangat congratulated Pax Earth on reaching 9th anniversary, praised for providing dustbins and assured to place them in some strategic points so that the devotees and local community can utilise them properly to clean Pashupati area. A few staff of the ward office were also present on the occasion. Member Prabin Giri coordinated this program. 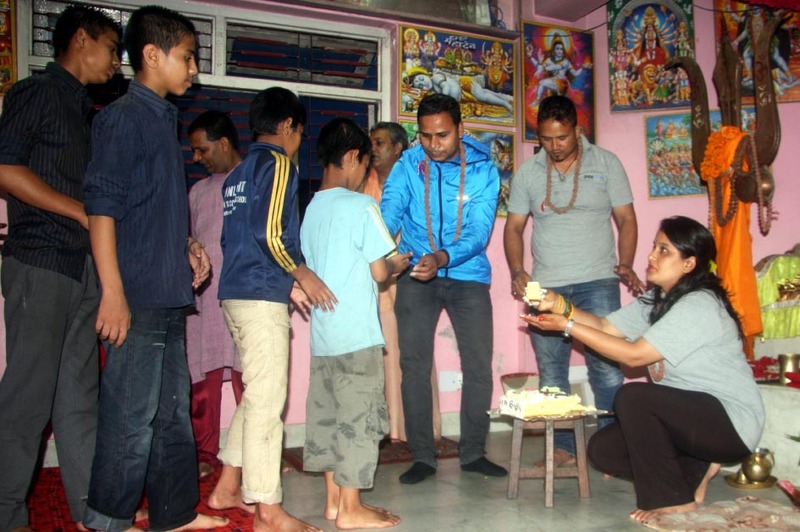 On July 16th evening, Pax Earth celebrated 9th anniversary with 50 underprivileged students of Pranavananda Ashram, Guheshwori, Kathmandu. A Pax Earth team comprised of president Sujan Koirala, special guest Rabindra Man Joshi, vice president Guna Raj Pyakurel, treasurer Bal Gopal Shrestha, board members: Jamuna Siwakoti, Bhagabati Pandey, Laxman Bd. Pahari, Manohar Sapkota, members: Debraj Ghimire, Kapil Deuja, Sital Mainali, Prabin Giri, well-wishers: Salina Basnet and Prakash Adhikari were present on the occasion. Principal Raja Ram Yadav cordially welcomed each member of Pax Earth at the Ashram. The Pax Earth team observed evening prayers and chanting by the students. The youngest student at the Ashram cut the anniversary cake and everyone present on the occasion sang the birthday song. Pax Earth members served each student with a piece of cake. The students prayed to God for the progress, prosperity and a long life of Pax Earth and its members. Principal Yadav heartily thanked Pax Earth team for celebrating 9th anniversary among the students of the Ashram and wished for a great success in the days ahead. The Pax Earth team have had a plan to offer dinner to the students as well but the dinner program was already booked by somebody else. The Ashram is running classes from nursery to class 7. The most admired thing of the Ashram is it embraces orphans and underprivileged children throughout Nepal regardless of caste, religion, ethnicity and geographic location. President Koirala coordinated this program. After the program at the Pranavananda Ashram, the Pax Earth members gathered at New Banana Café, Mitrapark for cold drinks and snacks. 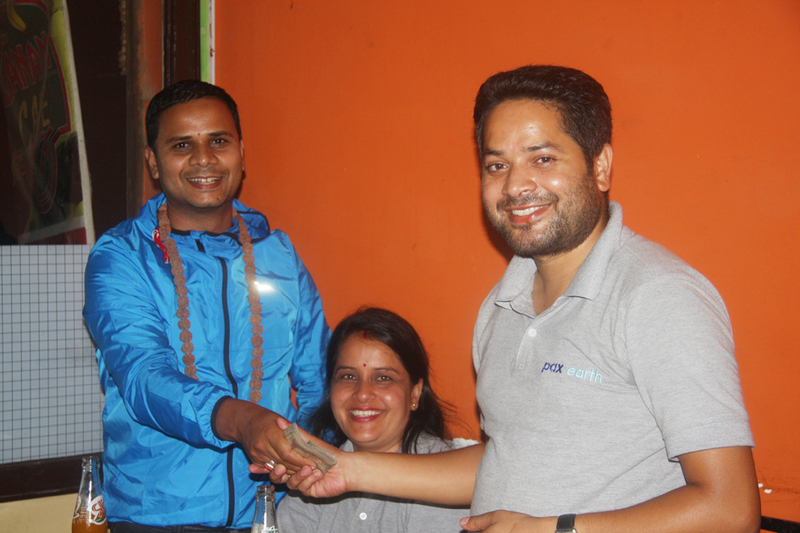 Member Debraj Ghimire handed a donation (Rs. 24000) to president Sujan Koirala raised by national representative of Australia Saroj Ghimire. Similarly, well-wisher Salina Basnet handed a token of support (Rs. 3400) to president Koirala sent by member Kamala Basnet for the dustbins. Special guest respected Rabindra Man Joshi congratulated Pax Earth team for successfully completing 9-years and wished for more social glories and successes in the days and years to come. He has assured to extend all possible support and advise in any matter(s). While extending a vote of thanks president Koirala expressed a sincere gratitude to national representative of Australia Saroj Ghimire for providing the donations to the organisation every year for last 6 years. He has assured to use the fund in the W2L project. President was grateful to member Kamala Basnet, co-sponsors Ganga Ram Bhandar and Kanchan Deuja for sponsoring some dustbins. 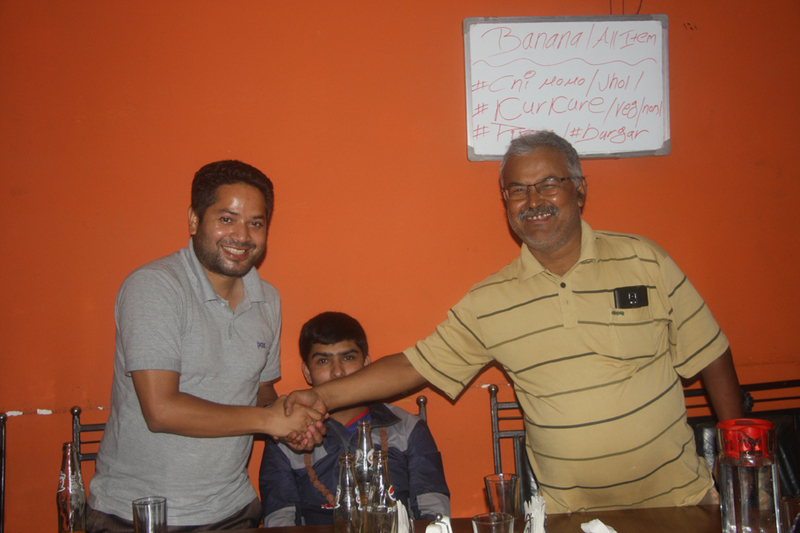 He sincerely thanked Rabindra Man Joshi for wholeheartedly accepting a proposal to become an advisor of the organisation. He heartily thanked board member Jamuna Siwakoti for coordinating for the dustbins and honorary member Kumar Nagarkoti for designing and printing token of appreciation and stickers for dustbins. Last but not the least, he was thankful to executive committee officials and members who actively involved in making both the programs a great success. Special guest Rabindra Man Joshi, president Sujan Koirala, vice president Guna Raj Pyakurel, treasurer Bal Gopal Shrestha, board members: Jamuna Siwakoti, Bhagabati Pandey, Laxman Bd. Pahari, Laxman Pd. Neupane, Manohar Sapkota, members: Debraj Ghimire, Kapil Deuja, Sital Mainali, Prabin Giri, Akira Sahukhal, well-wishers: Prakash Adhikari and Salina Basnet were present at the Café. On July 29, 2017, a Pax Earth team comprised of president Sujan Koirala, board members: Jamuna Siwakoti and Bhagabati Pandey, members: Debraj Ghimire, Kapil Deuja, Badri Sigdel, Prabin Giri, Pramila Amatya and Rounik Aryal visited the Pranavananda Ashram, Guheshwori, Kathmandu and served a dinner for 50 underprivileged students. Originally, the dinner program was planned to hold on July 16, 2017 (i.e. on 9th anniversary day) but somebody had already reserved the program for that day. Hence, it was rescheduled to July 19, 2017. The Pax Earth team not only served the meal to the students but also enjoyed the meal after the students. The Pax Earth team observed the evening prayers performed by the students and the Gurus before serving the dinner. 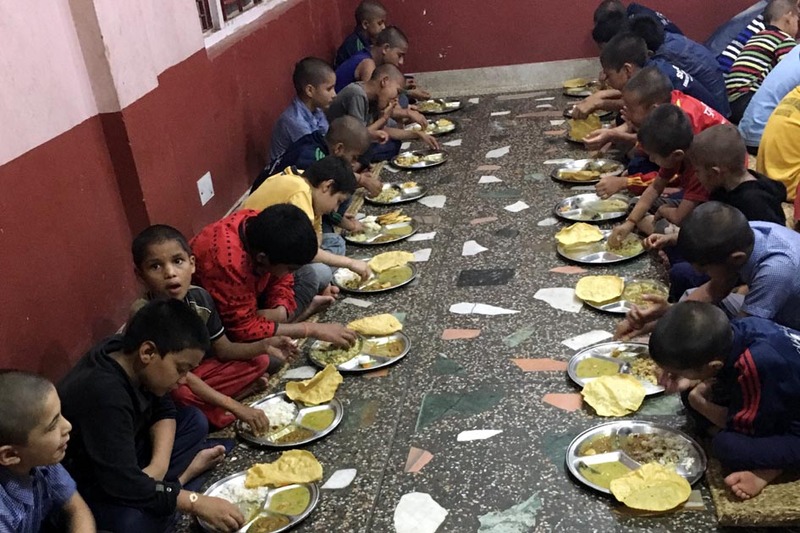 Principal Raja Ram Yadav expressed a sincere gratitude to Pax Earth team for serving the meal for the underprivileged students and looked forward to any support to contribute in the education of the students in future. President Koirala coordinated this program. Pax Earth would like to thank member Kamala Basnet, co-sponsors Ganga Ram Bhandar and Kanchan Deuja (from Australia) for sponsoring some dustbins. We are grateful to KMC ward 8 chairman Dinesh Kumar Dangol, ward member Bibek Sangat and the staff for their praiseworthy co-operation at the dustbin distribution program. We are thankful to principal Raja Ram Yadav and students of the Pranavananda Ashram for accepting our offer to celebrate the 9th anniversary with them. Board member Jamuna Siwakoti deserves a special thank for handling the procurement of dustbins and hon. member Kumar Nagarkoti for designing and printing token of appreciation and stickers for dustbins. Last but not the least, we are thankful to president Sujan Koirala and member Prabin Giri for the successful coordination, and the members, special guest and well-wishers for their active involvement to make all three programs of 9th anniversary a great success. Long live Pax Earth!!! Previous postPAX EARTH LAUNCHED THE PHASE-II OF WATER TO LIVELIHOODS (W2L) PROJECT TO HELP IMPROVE LIVELIHOODS OF RURAL FARMERS Next postPAX EARTH SUPPORTED FLOOD AFFECTED STUDENTS IN CHITWAN!